from Saturday, October27th of the year2007. This is exactly right, and properly dressed for the occasion; a big pile of notes. Tonight, if they let me, I might kill that bottom F to make some more room up in there. I’m not sure if, in a few days, I’ll feel like the right thing to do is to go back and really space out my first chord properly, but for now, I’m happy. Is your timpanist busy, at this time? I bet he totally wants to steal that F you drop off the top and get allupinbetween the bass trombone and tuba. 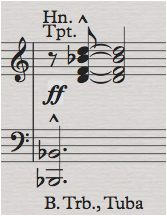 The second chord is almost the same chord Hartmann ends his Concerto Funebre with. It’s one of the most unforgettable chords of the 20th century. Sehr gut! I was there Fri and Sat night and loved even more the second time. Is going to be available soon, iTunes or cd? up above. Of course, without the voice-leading, this is just comparing surface details, but they be very nice surface details. 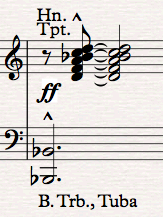 I love it when the typmanist gets allupandinbetween the basstrombonist and the tubist.